You’ve probably found us while searching for FindLaw reviews because you’re looking to sign up with FindLaw for Internet marketing services like SEO, web design, or other Internet marketing services. We’ll explain in this review why FindLaw isn’t a good solution for Internet marketing for lawyers. 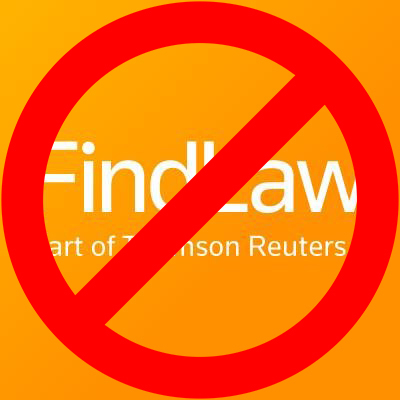 Out of the above issues that were mentioned the most important issue with FindLaw that we have with them is their poor SEO results. In the end of the day, that’s what you’re paying them for and you need good SEO to rank which then translates into new clients. URL’s are not properly optimized. They have file extensions showing and capitalized letters in the URL. Some pages are targeting several different cities on the same page. For the law firms that also paid FindLaw to blog for them, new blog posts are only made once a month. Title tags not properly optimized (keyword stuffing, no title tag on some pages, inconsistent formatting, etc.). Very little content on practice area pages. Generic content and stock photos. Not enough backlinks are created. Now that we’ve reviewed the reasons you shouldn’t hire or renew your contract with FindLaw and the issues that make FindLaw a bad option, we’ll tell you what to look for in finding the right alternative marketing company to FindLaw. You want a company who is transparent and honest and will answer your questions and provide insightful answers as to what they’ll do for you and how. You want a company who has no lengthy contracts and is on a month-to-month contract. This means that you can cancel whenever and holds them to a high standard to get you results or else you will leave them. This is what makes a good company from a bad one. Just think, how does a 24 month contract help your law firm? It doesn’t. It only helps the company doing the work for you (FindLaw) so that you aren’t able to leave when you are unsatisfied and get no return on your investment. You want a company who tracks results and uses data to make decisions. Here at CoFlex Marketing, we track the following for our clients every month: phone calls generated, contact form submissions, amount of monthly website visitors, keyword rankings, and website visitor data. You want a company who specializes in working with only law firms. You want a company who will exclusively work with your law firm only — not your competitors in your area as well. Our company, CoFlex Marketing, works exclusively with law firms like yours across the United States to generate new cases. Let us show you what we can do to help your firm increase your case load. With month-to-month contracts, actual results, exclusive agreements, and stellar support, you’ll soon see how we’re far better than FindLaw. Click the button below to request a free phone consultation and we’ll show you how we can help bring you new cases. Reviewed by CoFlex Marketing on June 4 . Search engine optimization & website design services for lawyers. FindLaw is a company that you need to be careful of because of their bad business practices and lengthy contracts.